This time last year, I was ready to launch a special project called Good Food: Local. My team and I created a special curriculum and taught over 1,000 students how to cook using crops grown right here in Southern Illinois! Our students ranged in age from preschoolers to 87 years young! I wasn't successful in getting the grant to do this a second year and we are all pretty sad about that ... Part of our project included a series of cooking columns published in local newspapers. I'm posting one of those columns today ... because it is almost time for the early harvest of kale and chard! I can't wait! When I want to grill Filet Mignon, I always buy the whole beef loin and cut the steaks myself. I do that for several reasons, not the least of which is the fact that the price per pound is much less for the whole piece of meat. I am also a bacon snob and prefer just a couple brands, so I like to wrap my own bacon around my steaks. If you don’t want to bother with this little bit of extra work, at least buy your filets without the bacon. Often times you are paying the same per pound price for that slice of bacon that you are paying for this most expensive cut of beef. There are butcher shops, though, that weigh the beef only and throw in the slice of bacon for free. When you use the whole piece of loin, you usually have a little section of the meat left. The thin end is hard to piece into a steak, but it is a good piece of meat to cook whole and slice thin. It makes a great meal. That is what I prepared for today’s column. We are so lucky in Southern Illinois to live in our own little melting pot of ethnicity! I have always enjoyed friendships with people from all over the world and early in my marriage I was fortunate to learn cooking techniques from an elderly neighbor who had come from a big Italian immigrant family. She made the most wonderful red sauce that cooked all day on the back of her stove and on the other back burner; she often had a big heavy pot filled with risotto. She cooked her rice the old fashioned way, adding a little chicken stock to it every thirty minutes, until it absorbed the most wonderful homemade flavors! Today, I’m sharing a recipe for quick cook risotto and I’ve used it to stuff tender leaves of Swiss chard. I’ve spent a lot of time this summer encouraging our cooking class students to put lots of dark green vegetables in their daily menus. There was a time when I would have turned my nose up at chard or any other kind of greens, but after a cancer diagnosis fifteen years ago, I changed my ways! Dark green vegetables are really good for us and if you want to boost good health, I encourage you to add them to your diet. A cup of cooked Swiss chard provides twice the Vitamin A we need in our daily diet and over half the Vitamin C we need. You also get a dose of iron and calcium from that cup of chard. We’ve encouraged our students to add a handful of chopped kale or chard to other things they are cooking. Try it with scrambled eggs or added to a pasta cream sauce or red sauce. Today, I’m stuffing mine with that delicious risotto! 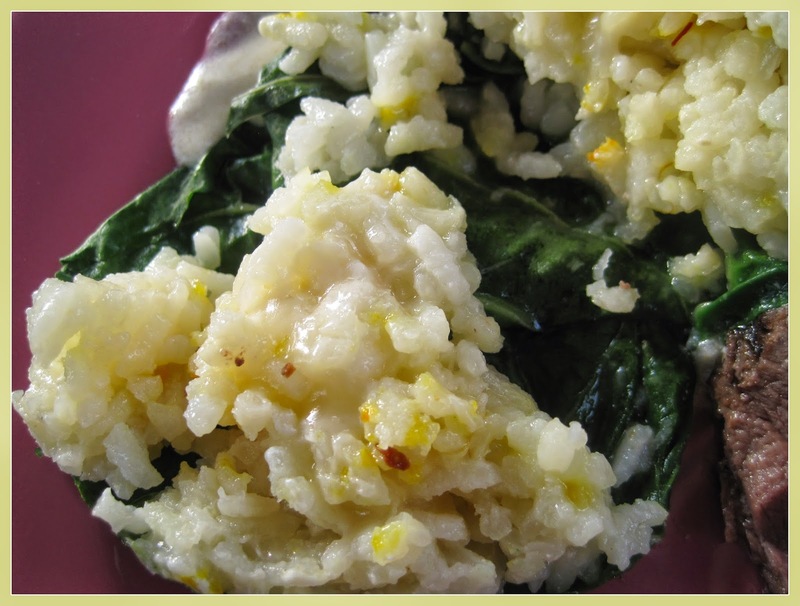 I think the combination of flavors and the texture of the chard with the creamy texture of the rice makes a delicious bite of goodness! It’s blueberry time and they are so delicious this year. Each of the children in our cooking classes this week is taking home a quart of blueberries. Kids love berries of all kinds and you should see their eyes light up when we tell them that they have a whole quart to share with their families. I try to really think ahead during our Southern Illinois fruit and vegetable season and because I enjoy giving Blueberry Crumble Bars to friends at Christmastime, I’ve frozen eight quarts of blueberries. Freezing blueberries is easy. All you have to do is wash them and pop them in a freezer bag and put them in the freezer. 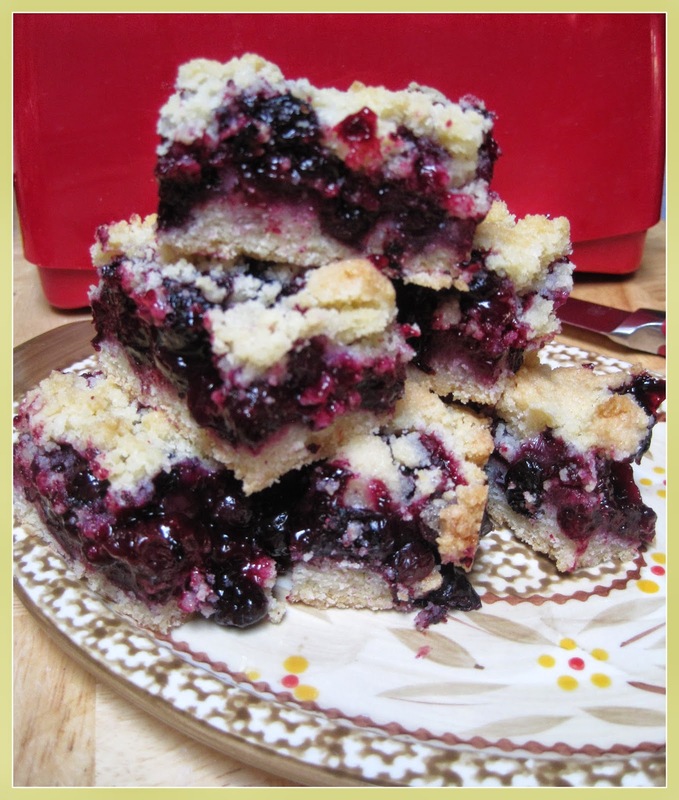 I’m also sharing that cookie bar recipe today, so you’ll have a reason to add some vitamin rich blueberries to one of your summertime menus. I hope you’ll try some of my recipes this week. We are at the peak of blueberry season, so don’t miss out on that sweet treat. 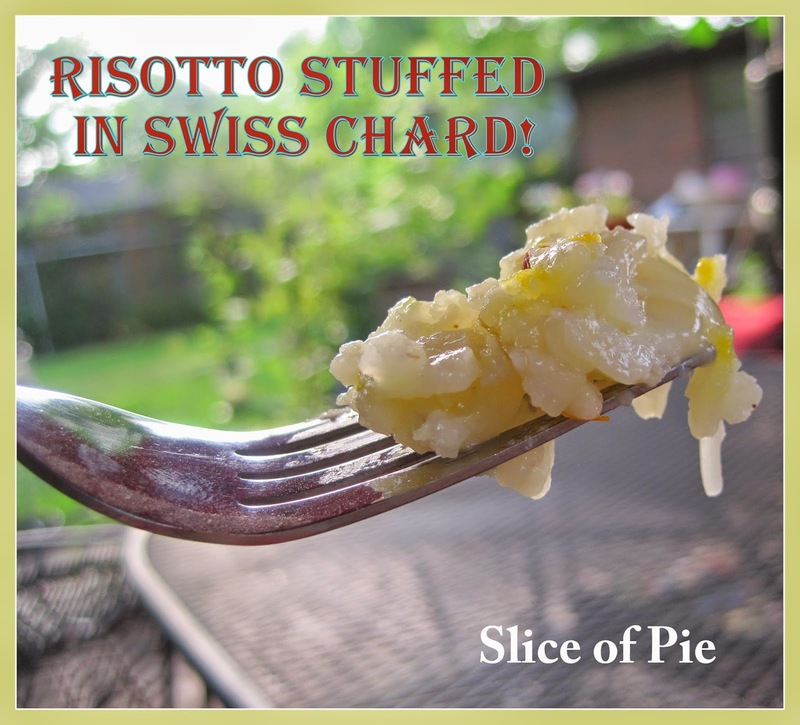 You should be able to find some Swiss chard at a farmers’ market and the rest is up to you! Buy local and you know you’ll have good food! Sauté the onion in the olive oil and butter for 2 minutes, then pour in the dry rice and stir the mixture as it toasts for another 2 minutes. Add 1 cup of the broth and stir until the liquid is gone. Add another cup of broth, the Saffron and pepper flakes. Turn the burner to low, cover the pot and let this cook gently for about 5 minutes. Add the remaining cup of broth, cover the pot and let it cook for another 5 to 10 minutes. Check the rice and stir it occasionally. When the rice has absorbed all the liquid, it should be done. Put the lid on the pot and remove it from the heat. It will continue to soak up the flavors and will have a creamy, sticky texture. To make the stuffed chard leaves, blanch each leaf in simmering water for about 30 seconds. Place the leaves on a couple layers of paper towels. Using a sharp knife, cut the center stem from each of the leaves. Place two leaves on a cutting board so that the opening in the leaves is covered with the other leaf. Using an ice cream scoop, place about ¼ cup of the rice in the palm of your hand and use your hands to make a ball. Stick a small cube of cheese down into the rice ball and seal the opening again. Place the ball on the leaves of chard and wrap them up around it. Place the stuffed leaves in a casserole dish, with the open edges of the leaves on the underneath. Place the stuffed leaves side by side. Add 1 cup of chicken broth or water to the casserole. Cover it and bake it at 350 degrees for 15 minutes. 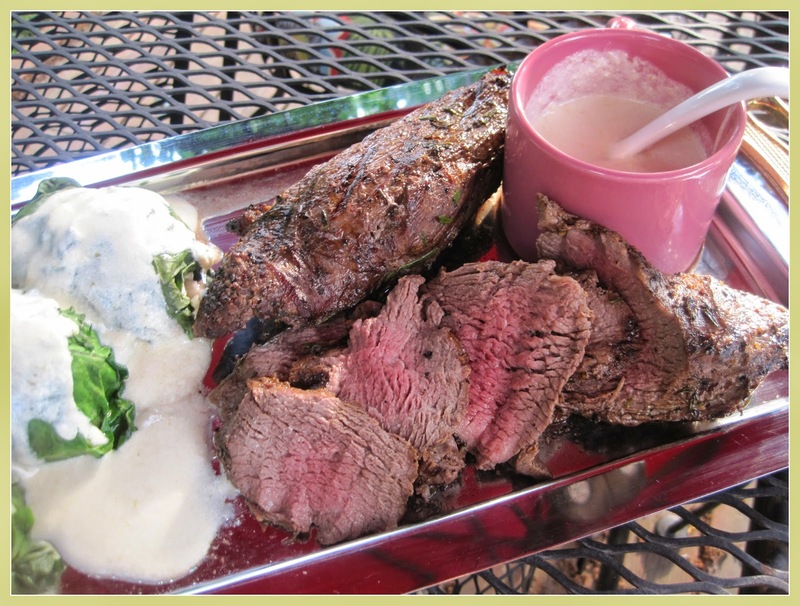 Serve them with Lemon Mustard Cream Sauce. Gently sauté 1 Tablespoon of lemon grass paste and 1 Tablespoon of honey mustard in 2 Tablespoons of butter for 2 minutes. Whisk in 1 cup of Half and Half and continue to simmer for about 3 minutes, until the sauce bubbles and begins to thicken. Pour this over prepared stuffed chard leaves and serve immediately. Place your beef on the counter so it can come to room temperature. Make sure all the silver skin has been removed from the surface and dry it with a paper towel. Rub the surface of the meat with olive oil. 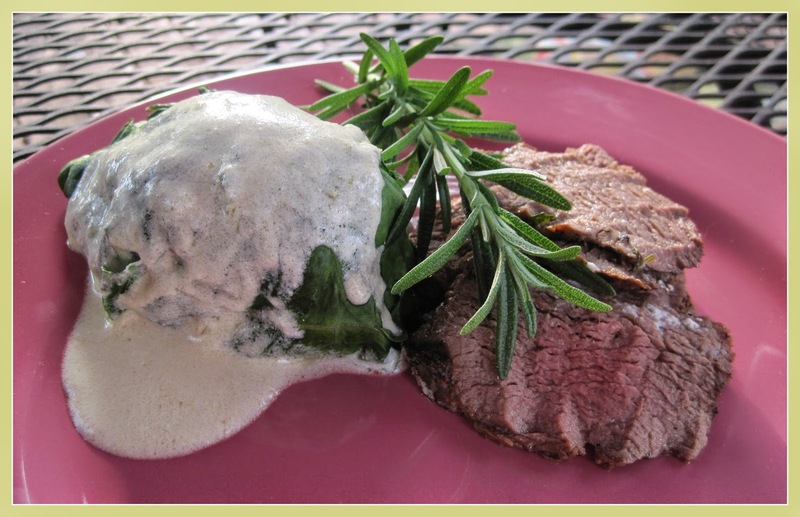 Prepare 2 Tablespoons of chopped Rosemary leaves and pat those onto the surface of the meat. Salt and pepper the surface of the meat. Place the filet on the grill over high heat and turn it to char all sides. Let it grill for 1 minute on each side. This sears the surface of the meat and helps keep the juices in. Move the meat to indirect heat or turn your gas grill flames down to low and continue to cook the meat until the internal temperature reaches 135 degrees for medium rare. The amount of time required to cook the meat depends upon the weight and the thickness of the meat. It will take anywhere from 15 to 30 minutes, turning the meat one time during that time. Remember that your filet of beef has almost no fat on or in it, so don’t overcook it or you’ll dry it out too much. In a food processor with the cutting blade in place, combine 1 cup of sugar with 3 cups of flour, 1 teaspoon baking powder, ¼ teaspoon of salt, 2 sticks of butter and 2 eggs. Pulse the processor until you have a crumbly mixture. Press two-thirds of this mixture into the bottom of a prepared 9 x 13 inch pan. Reserve the remaining mix for the topping. Combine 4 cups of blueberries with the zest and juice from a lemon, ½ cup of sugar and 4 teaspoons of corn starch. Mix this well and spread it over the crust. Now, top the blueberries with the remaining crumble mixture. Bake at 375 degrees for approximately 40 minutes. Let these cool before cutting. ** You can make these with blackberries, raspberries or strawberries! Let me Introduce you to Witchy Rose!